Taberez Neyazi’s new book is a welcome addition to the literature on India’s rapidly changing world of media by one of its most enterprising scholars of communication. Centred around Neyazi’s PhD thesis submitted to the National University of Singapore in 2009, the book stretches well beyond the confines of a thesis to suggest how media have played a ‘catalytic role as mobilising agents in the ongoing democratic transformation of India’ (p. 4). The core of the thesis was Neyazi’s enterprising fieldwork with Dainik Bhaskar, one of the country’s two largest Hindi dailies. He zeroed in on the patterns of work in one of the paper’s 60-odd publication centres in Itarsi, a town of 100,000 people 90 kilometres south of Bhopal on the Bhopal-Nagpur road. His research on Itarsi forms two central chapters of the eight-chapter book and provides some of the most revealing insights. After a long introductory chapter discussing theoretical frameworks, ‘Under Colonial Rule: Mobilisation in the Hindi and English Press’ examines the role of Hindi media—for Neyazi, this means newspapers—in the national movement against British rule. It contends that Hindi newspapers were a crucial mobilizing force in the struggle for Independence. ‘Media and Mobilisation in Independent India’ argues, however, that in the first twenty or thirty years after Independence, the mobilizing capacity of Hindi print media actually declined, as political elites focused on English-language publications. Hindi publications, now lacking the nationalist sense of mission as well as elite patronage and strong advertising revenue, languished. ‘The resurgence of the Hindi press’ came only in the 1980s ‘when the Ayodhya movement reappeared’ (p. 51). These chapters open up a conversation about the role of Hindi newspapers in the national movement. The argument about the importance of their role would be strengthened if readers had a sense of how large the print-run of a Hindi daily or weekly was in the 1920-50 period. Gandhi’s weekly Young India was said to have hit 40,000 copies a week in the 1920s, but it was in English. In 1951, Uttar Pradesh, the centre of the Hindi world, was more than 85 per cent illiterate. The report of the Registrar of Newspapers for India in 1958 recorded only one Hindi daily—Navbharat Times of the Times of India group—with a circulation of more than 50,000 (but less than 100,000). One estimate of Hindi circulations in 1952 reckoned about three Hindi dailies to every 1,000 Hindi speakers. In a discussion of how ideas of national freedom were communicated to Hindi speakers, the printers and publishers of Hindi fiction, religious tracts and inspirational pictures might be as worthy of consideration as newspapers. (Consider, for example, the work of Christopher Pinney and Kama Maclean). The author lists eight reasons why Hindi newspapers were in the doldrums after Independence. Though the new power-holders were acclaimed as nationalist heroes, they were most comfortable in English and consequently Hindi publications were treated as poor stepchildren. Among the eight reasons contributing to the passivity of Hindi newspapers, one appears crucial: in order to grow, newspapers need literates to read them and sellers to buy advertising. The vast Hindi tract of north India was weak in both. In ‘Localisation, Grassroots Mobilisation and Hindi News Media’ and ‘Political Economy of the Hindi Press’, Neyazi presents his fascinating fieldwork in Itarsi. Dainik Bhaskar saw the potential of towns like Itarsi, both for readers and revenue. The organization developed a format that emphasized local stories, supplements for young people and women, and aggressive sale of advertising. Even with this strategy of reaching out to new markets, however, the newspaper paid little attention to Dalits. It had almost no Dalits among its staff at any level, even though Madhya Pradesh had more than 10 million Dalits, two-thirds of whom were literate. The politics of the small town affects the newspaper. Management calls on stringers to sell ads as well as file stories. Neyazi is told of local criminals intimidating reporters, especially stringers, and of journalists being bribed to suppress embarrassing stories. He follows the intricacies of a case in which a Dalit medical doctor complained about hostile stories that portrayed him as incompetent and corrupt. After the doctor organized a protest which none of the newspapers reported, he complained to DB’s head office in Bhopal. Head office eventually backed the (caste-Hindu) stringer who wrote the stories. Neyazi makes no judgement on the specific case, but points out that the absence of Dalits in media organizations ‘has affected how the issues of Dalits are framed’ (p.102). 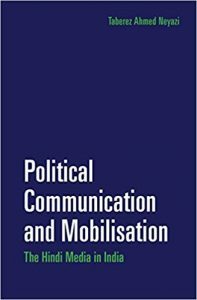 In the final two chapters titled ‘The Hybrid Media System, Anti-Corruption Movement and Political Mobilisation’ and ‘Agenda-setting and Mobilisation in a Hybrid Media Environment’, Neyazi uses two case studies to consider how digital communication is transforming the nature of media in the Hindi-speaking world. He takes up the term ‘hybrid media’, popularized by the British scholar Andrew Chadwick, to characterize the changes. Media, of course, have always been ‘hybrid’. That’s why ‘media’ are plural: print-on-paper is a medium; print, TV and radio are media. So were cave drawings, smoke signals and drums. Neyazi focuses on the anti-corruption movement that grew up around Anna Hazare in 2011 and the 2014 national elections, won resoundingly by the media-adept Bharatiya Janata Party. A crucial element in both events was the presence of new technology—to begin with, the humble 2G phone—that enabled consumers of media to become producers. This in turn meant that broadcast TV and printed publications had to change their ways of reporting and of interacting with consumers. Those consumers now had increasing sources of information, and could become reporters and broadcasters in their own right. Neyazi sees the ‘hybrid media system’ as carrying the ‘anti-corruption movement from a metropolitan and urban middle class to a more diversified public’(p. 159). He argues that ‘internet vernacularisation has further democratised the communication process’ (p. 196), but he makes no predictions about where this may lead Indian politics. Neyazi packs a lot of information and numbers into the book. For the benefit of readers, some of these might have been better digested. For example, it is never quite clear how he believes newspapers set their advertising rates. The key, he says, is ‘cost per thousand’, but thousand of what and determined by whom? The answer, of course, is the cost per 1,000 copies sold, based on the circulation of the publication, audited by an independent authority. The higher the audited circulation, the more the advertiser will be charged because more people will see the advertisement. Neyazi no doubt knows this, but greater clarity would have helped readers. A helpful editor could have picked up such ambiguities during the production of the book. The book relies heavily on statistics gleaned from Press in India, the annual report of the Registrar of Newspapers for India (RNI), which was first published in 1957. The RNI figures show trends over time, but they depend on the submissions of the newspapers themselves, and the figures are inflated. Neyazi seems not to have spent much time consulting the more reliable figures of the Audit Bureau of Circulations, to which newspapers subscribe in order to have plausible circulation figures with which to tempt advertisers. He also overlooks the readership surveys, carried out by publications, advertisers and advertising agencies. Six of them were conducted between 1970 and 1997, though a footnote on p. 70 appears unaware of this. These observations, however, are slight criticisms in the context of this ambitious book. It is worth the time of any scholar interested in the origins and consequences of rapid media change and in the evolution of political practice in India. Robin Jeffrey is at the Institute of South Asian Studies, Singapore.